Vincent Brown and his ‘left wing’ alliance should try living in Iran for a while. Tell them how undemocratic a Country Iran is or that their existence and governance is from the barrel of a gun and see how you get on. And while you are at it, just for good measure, criticise the prophet Mohammed or the Islamic religion. Off with his head-oops. It is not just anti Israel, it is anti American, anti western lifestyle, anti law & order in favour of the criminal & anti anything that does not conform to the leftist/liberal agenda. This has been going on a while & it is very disturbing. The truth never comes out & at times, a version of the truth is told. 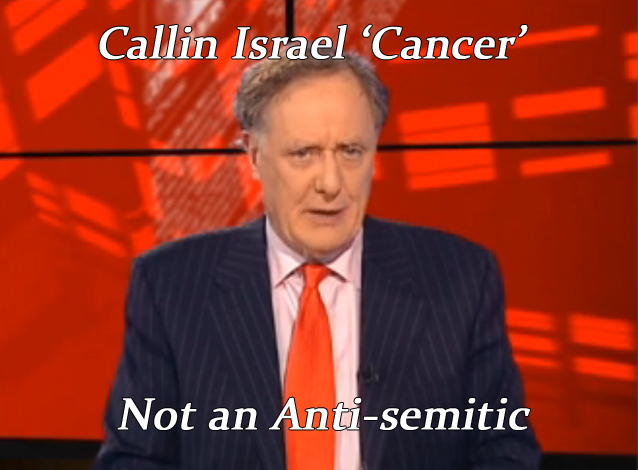 Regarding the anti Israel trait in Irish media, u have to look deeper & see who the people behind it really are. That’s where you’ll get the answer.The answer is the people who are behind it. Their agenda rests with them & not with Irish society as a whole. Leftist/liberals denounce in a subtle way all things western yet they never reject the western pay cheques & lifestyles. Israel is only one of their many targets. However, it is not all doom & gloom. In spite of everything, many Irish are center/center right & develop that way of thinking as they enter their 30’s. It is a wonderful surprise to me that the majority of Irish people never swallow the leftist/liberal crap. Over the last 30 plus years for example, RTE have tried to shove the Sinn Fein/IRA line down our throats. After 30 plus years, the majority never bought into it & it shows that while Israelis would be forgiven for thinking we Irish are anti Israel & anti Jewish, we are not. I would love to have the money to develop a centre/centre right newspaper & news website. Balance needs to be brought back into it. Balance, fairness & justness. Plus to counter attack the leftist/liberal agenda. They hate being challenged & hate the fact that people dare disagree with them.Hit them where it hurts, eh ??! !